Jakby zwolnienie tempa po intensywnym minionym roku. o parametrach: hp=250 km, ha=35786 km, i=3° satelity HS4-SGS1 (Hellas-Sat-4, SaudiGeoSat-1) i GSAT-31. Pierwszy start rakiety nośnej dla spółki Arianespace odbył się 5 lutego 2019 roku. Ariane 5 ECA wystartowała o godzinie 22:01 CET z kosmodromu Kourou wynosząc po 25 minutach lotu dwa ładunki na orbitę o parametrach 250 na 35786 km oraz inklinację 3 stopni. Satelity HS4-SGS1 (Hellas-Sat-4, SaudiGeoSat-1) oraz GSAT-31 dotrą własnymi siłami na docelową pozycję na orbicie geostacjonarnej. HS4-SGS1 to pierwszy satelita Lockheed Martin oparty o platformę LM2100. Ważący blisko 6,5 tony satelita zamówiony przez saudyjskiego Arabsata ma świadczyć usługi telekomunikacyjne przez co najmniej 15 lat. Na pokładzie znajdują się transpondery dwóch podmiotów: badawczo-rozwojowego centrum saudyjskiego KACST (King Abdulaziz City for Science and Technology) oraz spółki-córki Arabsata o nazwie Hellas Sat zarejestrowanej na Cyprze. Zmodernizowana platforma satelitarna LM2100 ma zwiększyć konkurencyjność satelitów telekomunikacyjnych budowanych w zakładach Lockheed Martina. Kolejny satelita oparty o tę platformę, Arabsat-6A, ma zostać wyniesiony w marcu w drugim starcie Falcona Heavy, nowej rakiety nośnej firmy SpaceX. “To największy i najpotężniejszy komercyjny satelita komunikacyjny, którego dotychczas zbudowaliśmy” komentuje start HS4-SGS1 Guy Beutelschies, wicedyrektor Lockheed Martin ds. satelitów komercyjnych. GSAT-31 został zbudowany przez Indyjską Agencję Kosmiczną (ISRO). Ważący ponad 2,5 tony satelita oparty o indyjską platformę I-2K ma świadczyć usługi telekomunikacyjne przez kolejne 15 lat. Zastąpi wyniesionego w 2007 roku Insata 4CR, który w wyniku awarii górnego stopnia rakiety trafił na orbitę niższą od planowanej i musiał zużyć więcej paliwa by trafić na orbitę geostacjonarną. The Ariane 5 payload fairing containing Flight VA247’s HS-4/SGS-1 satellite passenger is readied to be lowered over the GSAT-31 spacecraft – which previously was installed atop Ariane 5’s central core. 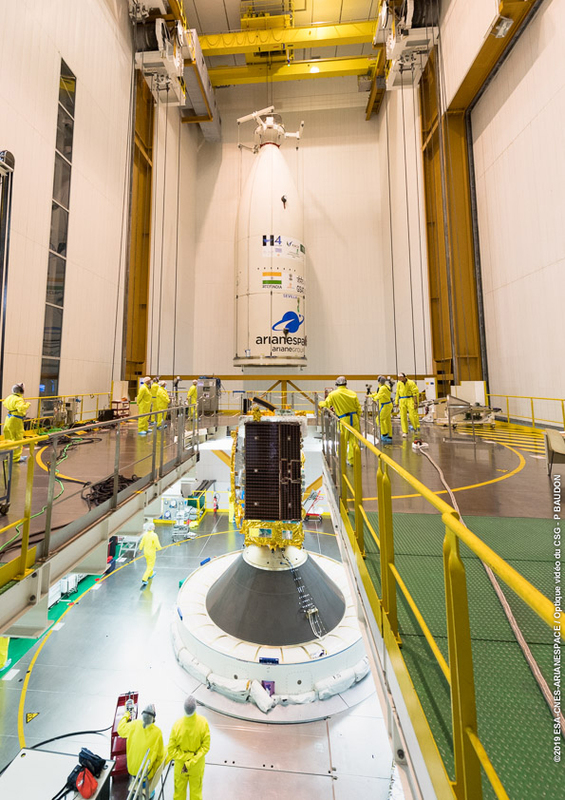 India’s GSAT-31 satellite is shown after its integration on the Ariane 5 launcher for Flight VA247 during preparation activity in the Spaceport’s Final Assembly Building. (...) Vaulting into a hazy, overcast evening sky with 2.9 million pounds of thrust, the Ariane 5 headed east from the European-run spaceport in South America, surpassed the speed of sound in less than a minute, and released its two side-mounted solid-fueled boosters around two-and-a-half minutes after liftoff. Moments later, the Ariane 5’s payload shroud — made by Ruag in Switzerland — jettisoned to fall into the Atlantic Ocean, and the core stage engine shut down and separated nearly nine minutes into the flight. An upper stage HM7B engine fired more than 16 minutes to accelerate the Hellas-Sat 4/Saudi Geostationary Satellite 1 and GSAT 31 communications satellites into an elliptical geostationary transfer orbit ranging between 155 miles (250 kilometers) and 22,236 miles (35,786 kilometers) in altitude. The Ariane 5 deployed the satellites one at a time, first releasing Hellas-Sat 4/SGS 1, then ejecting an adapter cover for separation of the GSAT 31 communications satellite more than 42 minutes after liftoff. Each satellite will use on-board thrusters to circularize their orbits more than 22,000 miles over the equator, where their velocities will match the rate of Earth’s rotation, giving the spacecraft fixed coverage zones, with Hellas-Sat 4/SGS 1 covering the Middle East, Europe and Africa, and GSAT 31 over India and the Indian Ocean. Arianespace, the French company responsible for launch activities at the Guiana Space Center, declared the launch a success, wrapping up the 103rd Ariane 5 flight since 1996, and the first this year. The bigger of the two satellites launching Tuesday is a multi-use craft for King Abdulaziz City for Science and Technology, or KACST, a government research institute in Riyadh, Saudi Arabia, and Hellas-Sat, a subsidiary of Arabsat headquartered in Cyprus. Known by KACST and Hellas-Sat as Saudi Geostationary Satellite 1 and Hellas-Sat 4, respectively, the satellite was built by Lockheed Martin in Denver, then shipped to the defense contractor’s facility in Sunnyvale, California, for environmental testing before flying to French Guiana aboard a cargo plane in preparation for launch. The Hellas-Sat 4/SGS 1 spacecraft is Lockheed Martin’s first commercial geostationary satellite to launch since 2012, representing the company’s return to the commercial market after a long emphasis on building satellites for the U.S. government. 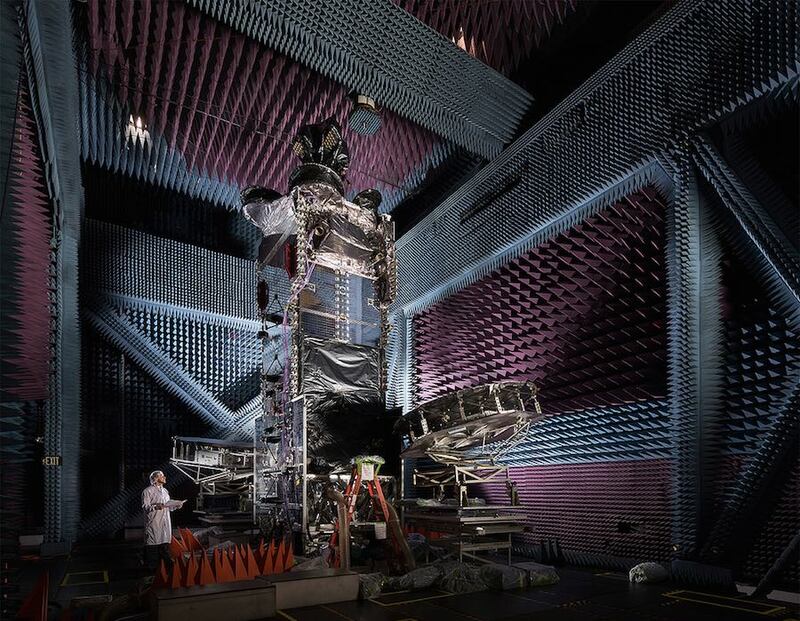 Another Saudi-owend communications craft based on Lockheed Martin’s modernized A2100 spacecraft bus — Arabsat 6A — is scheduled for launch as soon as March aboard a SpaceX Falcon Heavy rocket from NASA’s Kennedy Space Center in Florida. The Hellas-Sat 4/SGS 1 spacecraft weighs 14,319 pounds (6,495 kilograms) fully fueled for launch, and it will ride in the upper position inside the Ariane 5 rocket’s Swiss-made payload fairing. On-board thrusters will raise the satellite’s orbit from the elliptical transfer orbit reachable by the Ariane 5, to a circular position at geostationary altitude over the equator at 39 degrees east longitude. Designed for a lifetime of more than 15 years, Hellas-Sat 4/SGS 1 will provide Ka-band broadband Internet connectivity and other telecom services across Saudi Arabia and neighboring countries, including secure military communications for nations in the Gulf Cooperative Council, a group composed of Saudi Arabia, Bahrain, Kuwait, Oman, and the United Arab Emirates. The satellite’s Ku-band payload will be used by Hellas-Sat to beam direct-to-home television programming to parts of Europe, Africa and the Middle East. Lockheed Martin also trained 15 Saudi engineers during the manufacturing of Hellas-Sat 4/SGS 1 as part of a transfer of know-how under company’s contract with KACST. “The launch of Hellas-Sat 4 will increase our geostationary fleet to a number of three satellites,” said Kandeas Karantonis, Hellas-Sat 4 program manager at Hellas-Sat. 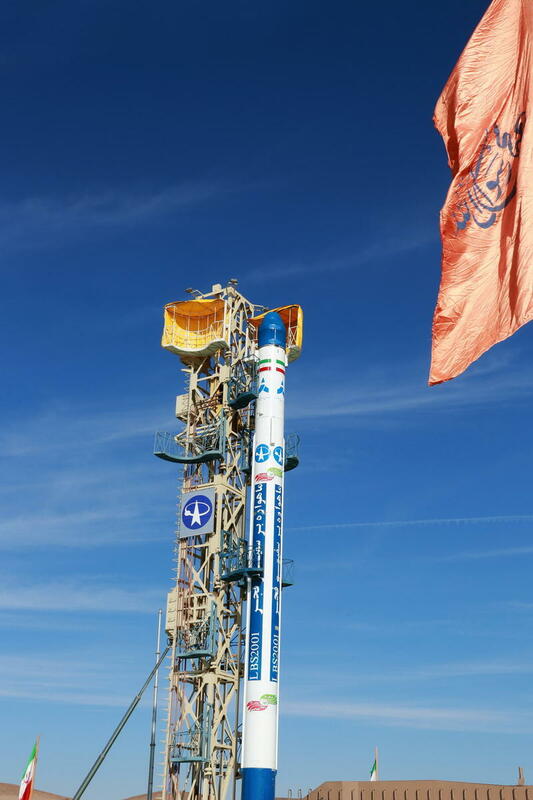 “The Hellas-Sat payload will provide Ku coverage over Europe, the Middle East and South Africa. It will provide extensive redundancy and backup capacities to further secure DTH (direct-to-home) networks and customer base and provide competitive advantages to customers in Europe and other areas. “We envision Hellas-Sat 4 to provide additional capacities for HD, 4K and free-to-air channels which will guarantee additional room for our existing and new customers to grow,” Karantonis said. A Lockheed Martin spokesperson confirmed ground controllers acquired signals from the new spacecraft shortly after Tuesday’s launch, and had extended its power-generating solar panels. 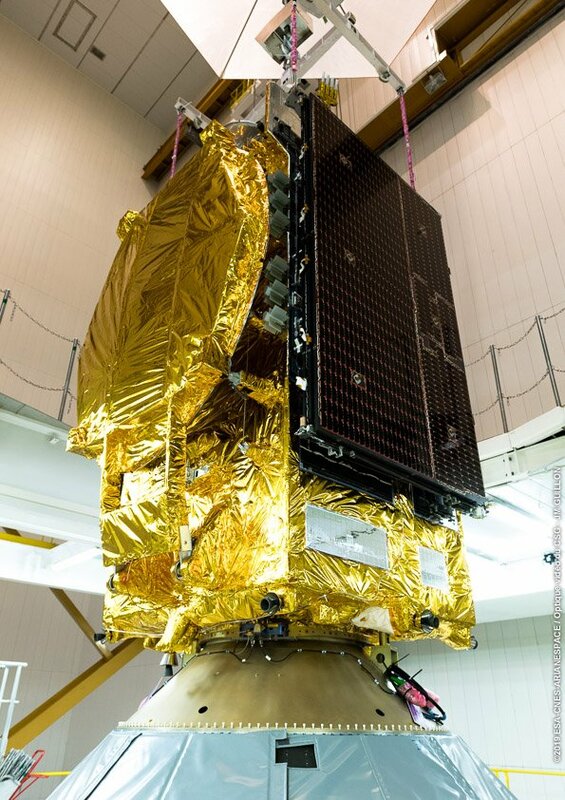 India’s GSAT 31 communications satellite will ride into orbit inside a Sylda dual-payload structure in the lower position in the Ariane 5’s payload fairing. The 5,590-pound (2,536-kilogram) satellite will maneuver into a geostationary orbital slot at 48 degrees east longitude for its planned 15-year mission providing Ku-band services to India and neighboring islands and oceans. GSAT 31 will support communications networks, broadcast television programming, and provide cellular backhaul connectivity across its coverage zone, according to the Indian Space Research Organization, which built and owns the spacecraft. 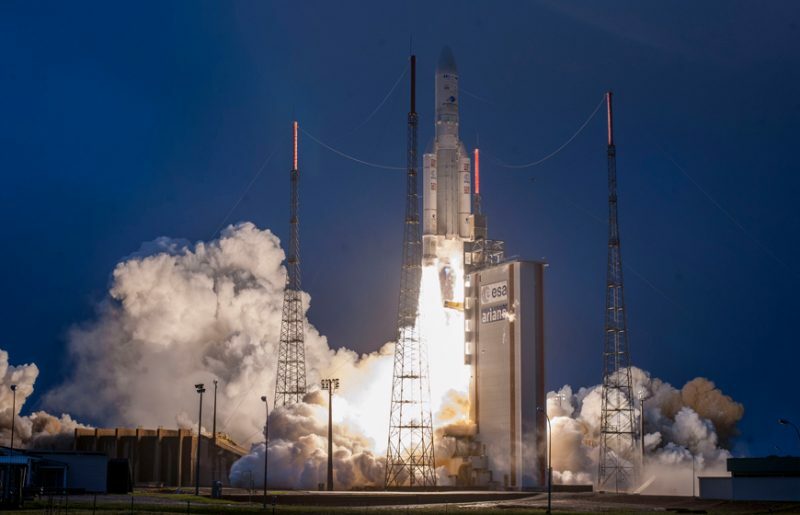 Tuesday’s launch marked the first of up to 13 missions planned from French Guiana this year by Arianespace, which oversees Ariane 5, Soyuz and Vega rocket flights from French Guiana. 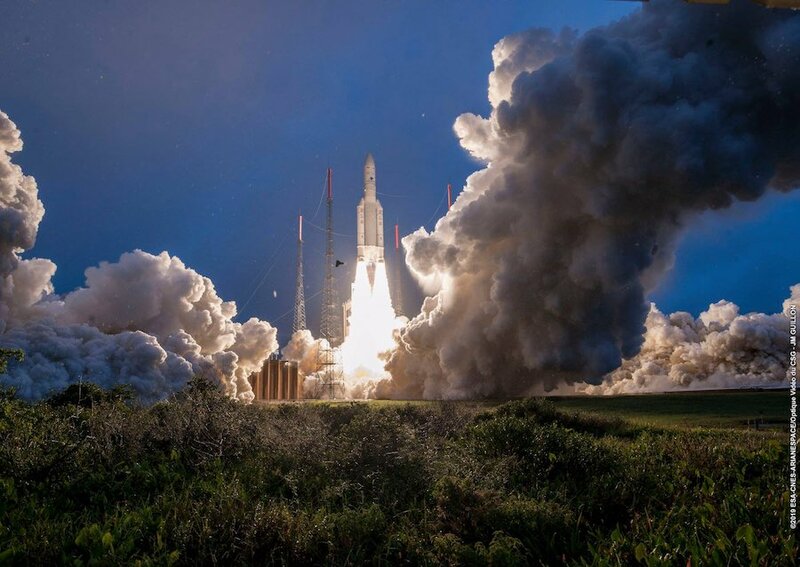 Arianespace logged 11 missions last year — six Ariane 5s, three launches by the Russian-built Soyuz booster, and two flights of the light-class solid-fueled Vega launcher. This year, Arianespace officials foresee up to five Ariane 5 flights, each with two satellites heading for geostationary orbit more than 22,000 miles (nearly 35,000 kilometers) over the equator. There are up to five Vega launches on this year’s schedule at the Guiana Space Center — four using the current variant, plus the debut launch of the Vega-C rocket at the end of the year with enlarged solid-fueled booster stages. Three Soyuz launches are scheduled this year from French Guiana — one with the first six satellites for OneWeb’s broadband network, another with four more O3b high-speed Internet satellites, and a mission late this year with an Italian radar observation craft and a European Space Agency telescope to study planets around other stars. That brings the total number of flights planned at the Guiana Space Center this year to 13. One more Soyuz launch could take off this year from the Baikonur Cosmodrome in Kazakhstan with another batch of OneWeb satellites, also through a contract with Arianespace. Arianespace’s launch schedule this year — if achieved — would set a record for the most missions in a calendar year in the company’s history. It would also mark the highest number of Vega rocket launches in a year since that vehicle flew for the first time in 2012. 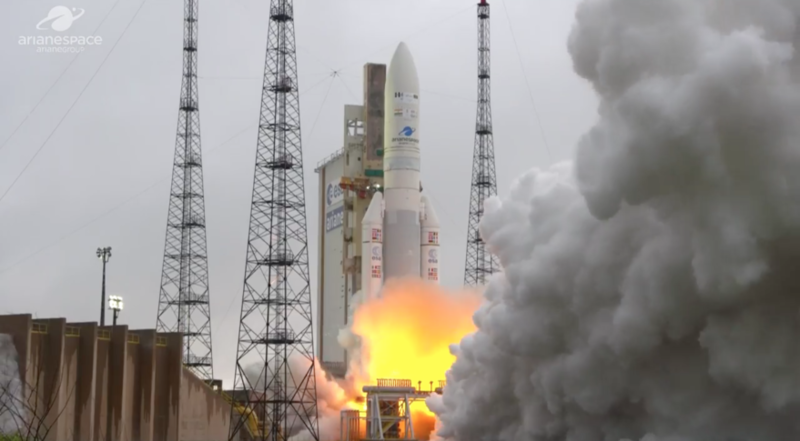 Arianespace launched the first of five Ariane 5 missions planned for this year on Feb. 5. The company anticipates conducting 12 launches this year, with more possible based on OneWeb's launch schedule. Credit: Arianespace webcast. WASHINGTON — European launch provider Arianespace completed the first Ariane 5 mission of the year Feb. 5, lofting two telecom satellites into geostationary transfer orbits. The Ariane 5, Europe’s heavy-lift rocket, took off from Kourou, French Guiana, at 4:01 p.m. Eastern. Saudi Geostationary Satellite-1/Hellas Sat-4, a hefty 6,500-kilogram “condominium satellite,” carrying payloads for two operators, separated from the launcher’s upper stage after 27 minutes. GSAT-31, a 2,540-kilogram satellite for the Indian Space Research Organisation, separated 42 minutes after liftoff. From geostationary transfer orbit, the satellites will use onboard propulsion to circularize into their nominal orbits 36,000 kilometers above the Earth. The launch is particularly significant for Lockheed Martin, as SaudiGeoSat-1/Hellas Sat-4 is the first commercial satellite to use the company’s modernized LM2100 platform. Riyadh, Saudi Arabia-based Arabsat purchased the satellite, which is divided into SaudiGeoSat-1 for KACST, the King Abdulaziz City for Science and Technology, and Hellas Sat-4 for Arabsat’s subsidiary Hellas Sat of Greece and Cyprus. Lockheed Martin said last year it had invested around $300 million on a tech refresh for the platform to increase its competitiveness in the geostationary satellite market. The LM2100 features more than two dozen upgrades, including new avionics, flexible solar arrays and a reprogrammable mission processor. SaudiGeoSat-1 carries a Ka-band payload for connectivity services across the Gulf Cooperative Council region. Hellas Sat-4 features Ku-band capacity covering Europe, the Middle East and South Africa. The so-called condosat has a design life of 15 years, with enough fuel onboard to last for 23 years. 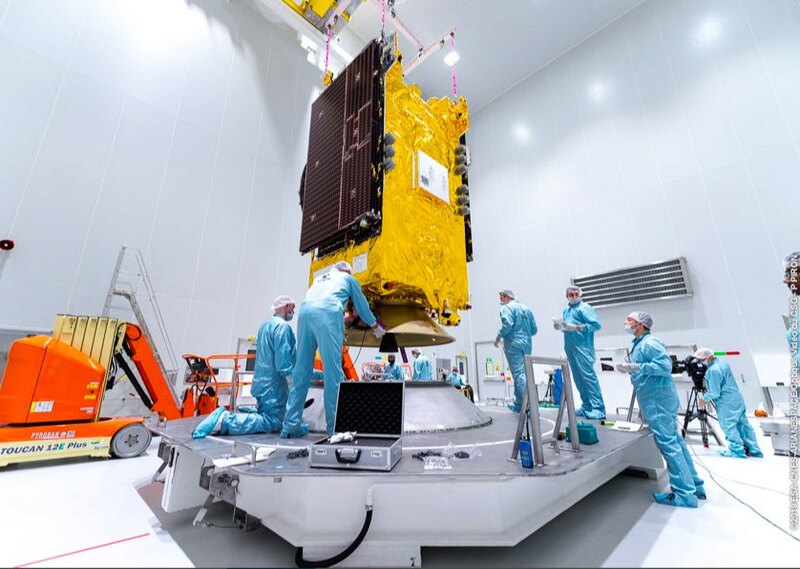 Arabsat has a second LM2100 satellite, Arabsat-6A, slated to launch later this year on a SpaceX Falcon Heavy rocket. GSAT-31 was built by ISRO, and is designed to last more than 15 years, though the operator did not specify by how much. Geostationary communications satellites are typically designed to last 15 years, but it is not uncommon for them to continue to function for several additional years. GSAT-31 will cover the Indian subcontinent with Ku-band beams for television broadcasting, cellular backhaul and very small aperture terminal connectivity. The satellite joins ISRO’s fleet of 18 communications satellites, providing continuity of service for the Insat-4CR and Insat-4A, according to the agency. Arianespace’s next launch is a Soyuz mission from French Guiana with the first six low-Earth-orbit broadband satellites for OneWeb. Stéphane Israël, Arianespace CEO, said in a speech following today’s Ariane 5 launch that the OneWeb mission is tentatively planned for Feb. 22. That mission slipped three days after the discovery of a technical issue with the Soyuz rocket. Arianespace anticipates launching at least 12 times this year, of which five missions are Ariane 5 dual launches with two satellites each. Może niekoniecznie - chyba wczoraj odnotowaliśmy kolejny start z Iranu. Zakończony - jakżeby inaczej - niepowodzeniem. ?? ??:?? Mojave 12/30 B-747/LauncherOne balast, ? x ? ?? ??:?? Sriharikota PSLV EMIsat, 30 x ? prawdopodobnie we wczesnej fazie pracy pierwszego stopnia. Start rakiety z bazy wojskowej w Semnan miał wynieść satelitę obserwacyjnego Dousti (دوستى po persku przyjaźń) na niską orbitę okołoziemską na wysokość między 250 a 310 km. Inne źródła wspominały o orbicie na wysokości 500 kilometrów. Ważący 52 kilogramy satelita obserwacyjny został zbudowany przez teherański Sharif University of Technology i miał wykonywać zdjęcia z rozdzielczością 30 metrów na piksel. Pierwsze informacje twierdzą, że do awarii rakiety nośnej doszło tuż po starcie. Safir-1B to dwustopniowa rakieta nośna napędzana na paliwo ciekłe, będąca w stanie wynieść kilkadziesiąt kilogramów ładunku na niską orbitę okołoziemską. Rozwój rakiety odbywał się przy pomocy Korei Północnej, która przekazała część swojego doświadczenia technologicznego Iranowi. Ostatni udany irański start orbitalny odbył się w lutym 2015 roku, gdy umieszczono na orbicie satelitę Fadżr. W kwietniu 2016 roku w locie suborbitalnym Iran przetestował pierwszy stopień rakiety Simorgh. (...) Images of the launch pad in north-central Iran taken by orbiting satellites owned by U.S. companies suggest a rocket launch occurred last week, but the U.S. military’s catalog of space objects registered no new spacecraft in orbit. A satellite launch attempt was expected in recent weeks based on statements from Iran’s government and observations of increasing activity at the launch site. One image taken by DigitalGlobe’s WorldView 3 Earth observation satellite Feb. 5 shows launch preparations at the site in full swing, with the shadow of a rocket visible at the spaceport in Iran’s Semnan’s province. Another pass by WorldView 3 over the launch base Feb. 6 produced an image showing burn scars at the circular launch pad, and a nearby stream of runoff, likely from post-launch wash-down activities. A fleet of Earth-imaging satellites owned by Planet also monitored launch preparations at the Iranian spaceport. An image taken Jan. 21 shows a freshly-painted launch pad, and another from Planet on Feb. 6 shows scorch marks, like DigitalGlobe’s observations. Analysts believe the launch likely carried the Dousti microsatellite aboard a Safir booster, a smaller cousin of the Simorgh rocket that faltered during a launch Jan. 15 with the Payam-e Amirkabir imaging satellite. Dousti, which means “friendship” in Persian, was billed as a 114-pound (52-kilogram) remote sensing satellite in Iranian news reports ahead of the launch. Iran’s information and communications minister, Mohammad Javad Azari Jahromi, said Feb. 4 that Dousti’s launch was expected soon, the last in a series of government announcements in recent weeks about the planned launch. None of the official statements indicated when the launch would occur. Russia’s RIA Novosti news agency reported Iran’s deputy defense minister said that a launch last week delivered its payload into orbit, but the lack of any new satellites in the U.S. military’s public catalog of artificial space objects indicates the rocket failed before obtaining the speed required to enter orbit. Iranian officials acknowledged the Jan. 15 launch failure. Czy mamy wątek o najbliższym starcie Falcona 9? To za półtora tygodnia! Rzeczywiście jest! Dzięki za wskazanie wątku! Nieśmiało się spytam - nie ma żadnych zmian w planie na luty ze startami? Oczywiście, że są, tylko chwilowo jestem zawalony pracą, może wieczorem wykroję trochę czasu. 14 ??:?? Sriharikota PSLV-QL EMIsat, 30 x ? Dzięki za aktualizację! Warto się przyjrzeć zmianom w grafiku startów.